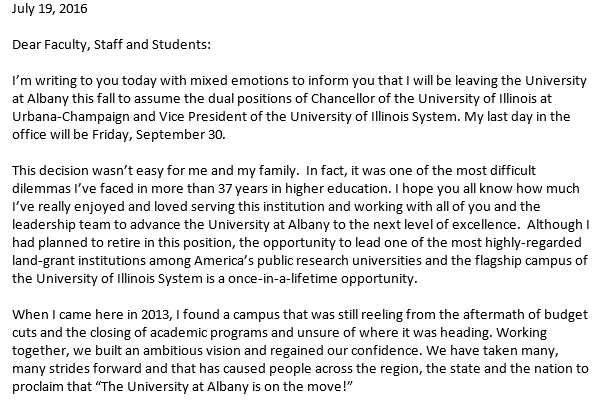 The president of the University at Albany is stepping down to take a job at the University of Illinois. Robert Jones is leaving UAlbany this fall to assume the dual positions of Chancellor of the University of Illinois at Urbana-Champaign and Vice President of the University of Illinois System. The 65-year-old Jones has headed UAlbany since January 2013: in a letter to the campus Tuesday, Jones said the decision to move on presented one of the most difficult dilemmas he's faced in more than 37 years in higher education. Chicago's WLS-TV reports Jones, who will become the first black chancellor of the UI's flagship campus, calls his new role his "dream job." 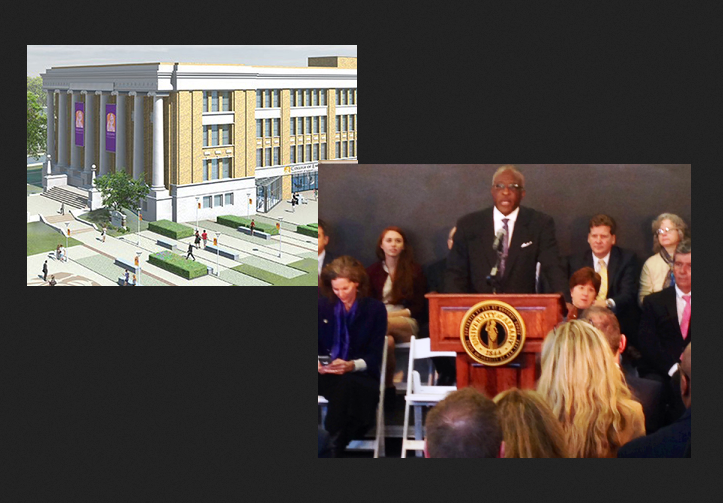 Plans call for Jones to be introduced to the UI campus and community at a public event Wednesday morning. His last day at UAlbany will be September 30. He takes his new office October 3rd. An interim president is expected to be appointed at the SUNY Board’s next meeting in September. Earlier this year, Capital Region community, business, education and government leaders announced the University at Albany’s $60 million plan to transform the century-old former Albany High School building into a home for its new College of Engineering and Applied Sciences. On Monday, many of those leaders gathered once again at the old school to share with the public their plans to conduct a joint study to look at "improving connections to downtown campus." The University at Albany has launched a new bachelor’s degree program in emergency preparedness, homeland security and cybersecurity. (Airs 12/17/15) WAMC's Alan Chartock In Conversation with University at Albany President Dr. Robert Jones.